Prescription drug theft is a major problem in this country, largely fueled by the epidemic of opioid (a.k.a. opiate or narcotic) abuse. When you depend on your medications to function, having them stolen can throw your life into turmoil. Just possessing opioid painkillers such as Vicodin or OxyContin puts you at risk for being a victim of theft. Do you know how to protect yourself, or what to do if your meds are stolen? When you think of your drugs being stolen, you may automatically picture being mugged by a violent stranger. That certainly does happen, especially to people leaving the pharmacy. However, you're probably most likely to be victimized by someone in your life. It could be a child or grandchild, or a friend. Not only is the high a big incentive, but those pills are also valuable on the street. None of us wants to suspect the people around us. You might think it couldn't possibly happen to you. Remember, though, that addiction is an insidious disease. It can make good people do things they wouldn't dream of otherwise. In addition, pain can make people desperate. Chronic pain often goes undertreated in this country. This may provide an extra incentive for someone to take your pills. And sadly, a suicidal person may also steal drugs in order to make an attempt on their life. Of course, if someone close to you has one of these motivations for stealing your drugs, it's a much bigger problem. Knowing the signs of addiction, the treatment options, and the warning signs of suicide is the first step toward getting them help. 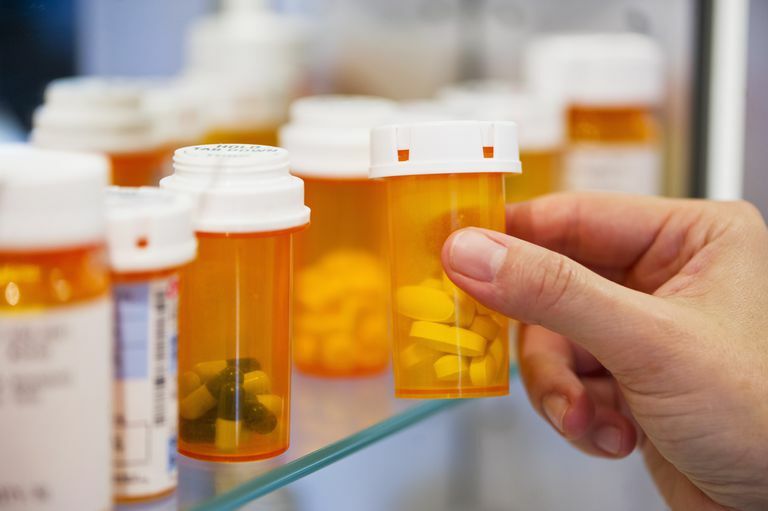 The best way to protect yourself from drug theft is to be discrete about medications that you are taking. Keep track of your pills with regular counts so you know if any are missing. It might help to keep a log of when you take them so you don't have to rely on memory if you suspect theft. If someone else picks up your meds from the pharmacy, do a pill count and make sure they're all accounted for. Sadly, people who work in pharmacies sometimes steal drugs, so it's a good idea to count them before leaving the pharmacy or to have the person helping you count them for you. If you get your meds by mail, consider a locking mailbox. Drug safes may also help. They're readily available online and in drug stores, and many of them are small enough to conceal in a drawer or cabinet. It's also a good idea not to put your empty pill bottles in garbage or recycling containers that are easily viewed by the public. At the very least, remove the label so no one can use the information to commit fraud. Even better, put them in a container that keeps them hidden. You don't want to give anyone a reason to mug you or break into your house. Some pharmacies will accept empty bottles for recycling, so check to see if one near you does. We need to be careful about taking our pain pills in public, or talking about them where we can be overheard. While you may not suspect people at work or church or whatever else you spend time, know that painkiller addicts come from all walks of life. They don't fit the stereotype of the shady street criminal who you'd probably never be around anyway. In fact, the CDC says that the people at highest risk to die from drug overdose are white men in their late 40s. Don't leave pills or pharmacy bags visible in your car, where they could lead someone to break out your window. Don't leave pills in an unlocked desk drawer at work. Don't leave them in your car. Not only is theft a risk, but extreme heat may cause unwanted changes to your meds. If you carry painkillers with you in a purse or bag, keep them in the original container. If your purse is ever searched by police, you need to be able to prove you have the drugs legally, which means a valid prescription or a verifiable prescription label. With FDA regulations requiring that we hand-deliver a paper prescription to the pharmacy every month, it gives thieves an opportunity to steal your prescription, too. Take the same precautions with those as you do with your pills. As with all aspects of personal safety, it pays to be aware of your surroundings. Is someone watching you too closely as you leave the pharmacy? Who might be paying attention at the restaurant when you take a pill? When your medication is stolen, it's a big problem. First of all, it means the drugs are in the hands of people who may be abusing them and harming themselves. For you, it could mean going a few weeks without painkillers. Most doctors will not refill narcotics prescriptions early, even if you have a police report of a theft. That might seem horrible to you, but it's for good reason. Talk to any doctor who spends weekends on call. They'll tell you it never fails: the calls start rolling in Saturday afternoon with people saying their drugs were stolen or making some other excuse for needing either a new opioid prescription or an early refill. Most of those people are drug seekers who are known by both the medical community and the police. Because of that, even showing up at your doctor's office with a police report probably won't help you get replacements. The drug seekers do that too often. That leaves legitimate pain patients who are the victims of theft with little or no recourse. If possible, get refills as early as you can, even if you're not out of meds yet, and try to keep some extras on hand. That's especially tough if you already have to ration them to get through a month—which many people do—but it may serve you well in the long run. Centers for Disease Control and Prevention. Prescription Drug Overdose in the United States: Fact Sheet.